Random orbit sanders have been around since the 1940's in the automobile and other metal finishing industry as air driven models. It was only when they were converted to electrically run tools twenty years ago, that they gained dominance, as the finishing sander of choice with woodworkers. 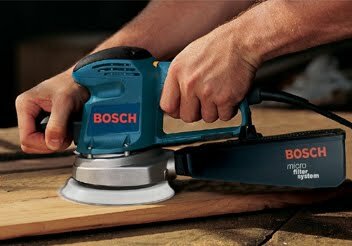 While they won't replace a belt sander for heavy duty rough surface smoothing or a 1/3 to 1/4 sheet pad sander for getting into tight corners, overall, they will end up doing 90% of your sanding for you...with much better results and far less effort. A random orbit sander relies on a pad that both oscillates from side to side and turns in a circular motion to create a virtually swirl free sanded surface. This makes them invaluable for sanding 90 degree joints on many wooden items such as rails and stiles and cabinet face frames. They tend to cut much more aggressively than other sanders and, unlike some other types, the less pressure you put on them, the better they cut. Consequently, they are far less tiring to use than traditional pad or belt sanders....and they do more work for the effort expended by the operator at the same time! Air driven Random orbit sanders require 14CFM or more air flow to operate. Because the average home shop compressor rarely puts out more than 4 to 10 CFM, we won't discuss them any further herein. There are two basic shapes of Random orbit sanders , regardless of whether air or electrically driven: Right angle (much like a grinder) and inline. There's a sub species of inline Random orbit sanders called "palm grip" as well. Because 5" disks are much easier to find and cheaper than the 6" disks, more than 70% of all Random orbit sanders sold are the 5" variety. Some come with PSA (pressure sensitive adhesive) pads and others come with H&L (hook and loop). Hook and loop (Velcro) disks are sold in boxes of 5, 25 and 50. Both 5" & 6" come in grits as large as 60 and as fine as 320 in a variety of paperweights. PSA disks are usually sold in rolls of 100. The jury is still out on which saves the most money overall as H&L disks can be changed at will and reused when switching to finer grits to finish off a project and PSA disks are, for all intents and purposes, for one time use only, once removed, they seldom stick tight again the 2nd time...except to each other. Almost all Random orbit sanders spin between 8,000 and 12,000 RPM. Most of the single speed models run at 10,000 RPM only. Many are variable speed with the operator controlling the orbits/RPM by two methods that work well in conjunction with each other: a knurled switch that adjusts and how much pressure the operator puts on the trigger switch. We find variable speed preferable to fixed speed, especially for touch up work on sanding sealer or topcoats. Palm grip Random orbit sanders are generally designed for finish work, sanding sealer and the like. The ones with handles are preferred for rough work and final sanding. advised that they will also need an adapter to fit these hoses into the 2 1/4" opening of a standard shop vacuum cleaner. Random orbit sanders should be brought up to full speed (whatever you've got it set at if it is variable speed) before coming into contact with the work surface. Likewise, it should be completely lifted off the work surface before it is shut off or even slowed down. Failure to do so may, and probably will, result in swirl marks in the work piece at the last point of contact. Most, if not all, ROS makers offer three different type pads for their machines: soft, medium and hard backed. All come standard with a medium pad. Hard pads are wonderful for use on wide flat surfaces. Medium pads will follow a shallow contour. Soft pads will follow any shape, within reason, and are excellent for things like cleaning up the profile on a raised door panel. For reasons known but to God, soft pads DO have a tendency to toss off H&L disks once in a while but the others don't. Random orbit sanders don’t use much current to do their work. They range from a low of 1.8 amps to 7 amps all well under 1 HP. Corner detail sanders have been on the market for years. They were invented by the Fein Corporation, who owned the market on the gizmo's at around $500.00 until Ryobi, came out with their single speed model for $49.95. Like Random orbit sanders, they sand by using a somewhat orbital motion, although a couple may be "in line" (straight back and forth) as we never actually checked since our eyes won't see a thing moving 1/32" or less at 8,000+ RPMs. A Corner detail sanders will fit almost anywhere you can stick your arm, with refined corners to give the user additional small, straight edges to sand to opposing parts, as inside of face frames.